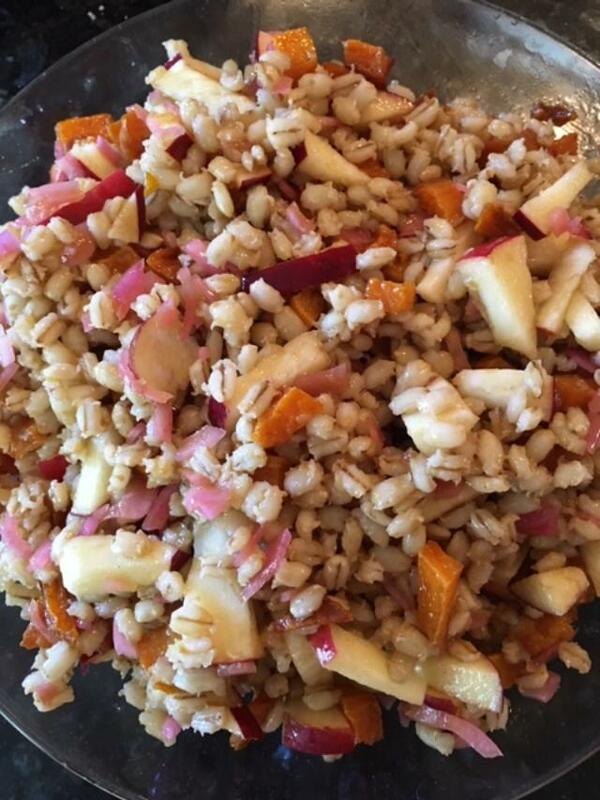 My friend Barbara makes tasty and pretty grain, vegetable salads for potluck suppers. One of her specialties at this time of year combines tender barley kernels and sweet bites of baked butternut squash. Recently there was a nice amount left over and she suggested I take some home. I scooped a few spoonfuls into a bowl and found it delicious for breakfast the next morning. A savory breakfast is a welcome variation. I remember the first time I sat down to a plate of white tahini, warm pita bread and olives for breakfast in Cairo. Amazing with cups of hot tea. The remains of a lunch or supper salad may equally fill in for a wholesome and interesting breakfast. 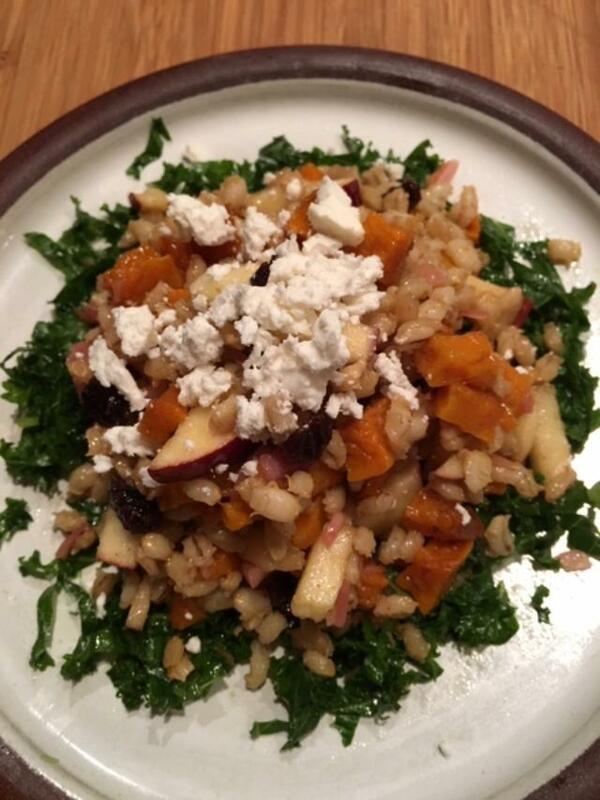 Now to the butternut squash, barley salad: The common barley on our grocery shelves is pearled barley. For the salad, the barley needs to be rinsed well to remove excess starch and simmered in plenty of water until swollen and tender. Count on up to 30- 40 minutes to cook the barley. Once the barley is cooked, it should be drained while hot and immediately dressed with vinegar, salt and olive oil. can go in the oven at any time you might be baking something else. It needs to cook gently and thoroughly until it releases most of its moisture and almost seems lightly candied. 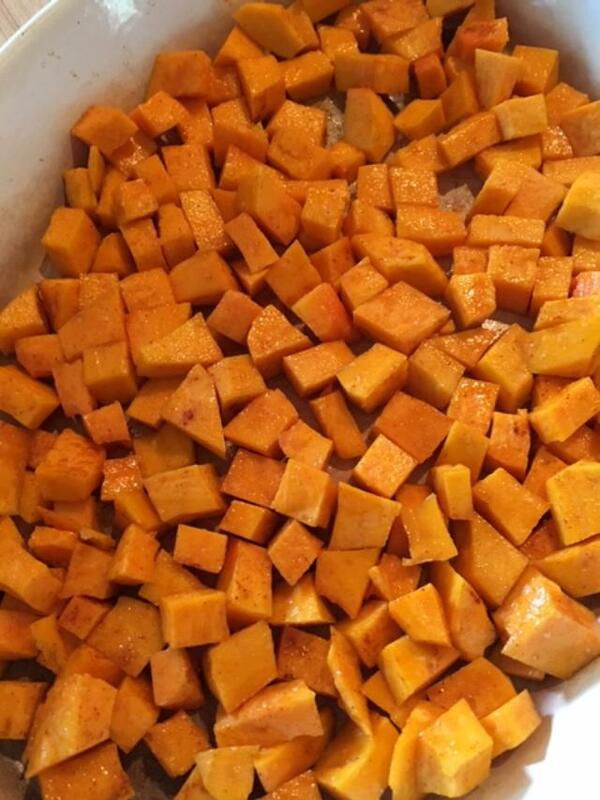 Seasoned, roasted squash cubes will hold in a covered bowl in the fridge for several days. limes and pack the juice soaked onion into a glass jar. Watch it turn beautifully fuchsia pink. Pickled onion keeps for weeks in the fridge and will garnish all sorts of salads, or sandwiches. Since it’s autumn we’ll add some diced tart apples, a sprinkling of currants, some last tender leaves of kale from the garden and feta crumbles when serving. ** pomegranate molasses is available in the Middle East food section of most large supermarkets. 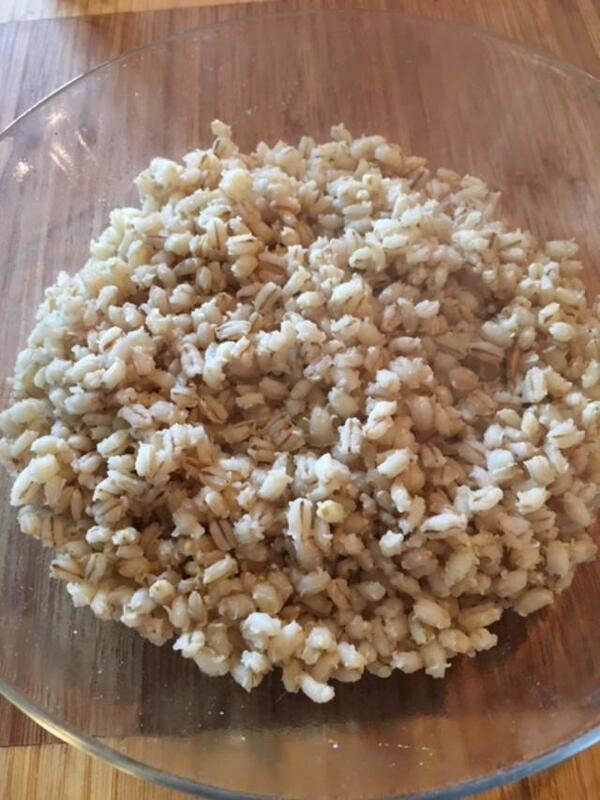 Rinse the barley in 3 changes of water. In a medium saucepan combine the barley and 2 cups of water; cover, bring to a simmer and cook 30 to 40 minutes or until fully tender. Drain, shake away excess water and season with salt, 1 tablespoon red wine vinegar and a tablespoon of olive oil. Mix well and set aside. Toss the diced squash with salt, pinch each of turmeric and paprika plus a tablespoon of olive oil. 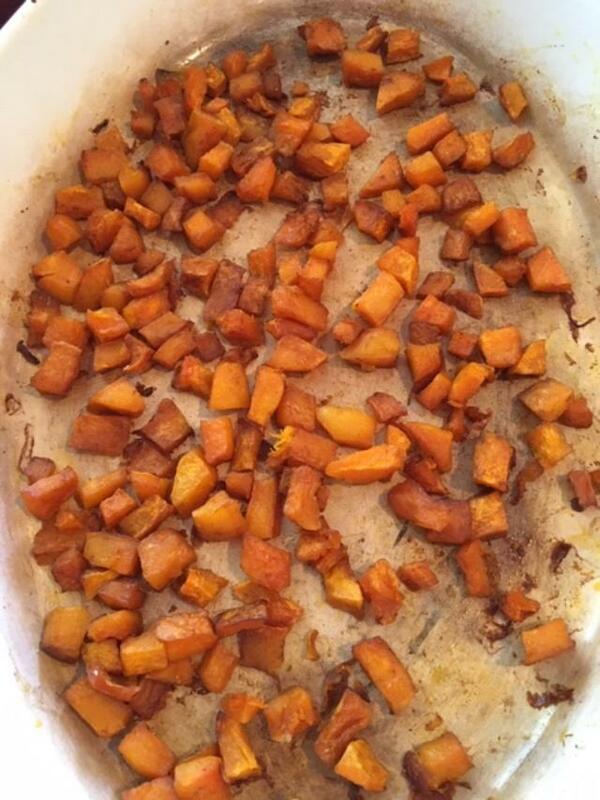 Spread it in a single layer in a baking dish and bake for 30-45 minutes in a moderate oven. The squash will shrink and dry but should not get hard. Prepare the dressing by mashing the garlic clove with a pinch of salt in a small bowl. Whisk in the remaining tablespoon of red wine or sherry vinegar plus the pomegranate molasses or balsamic vinegar and the last 2 tablespoons of olive oil. 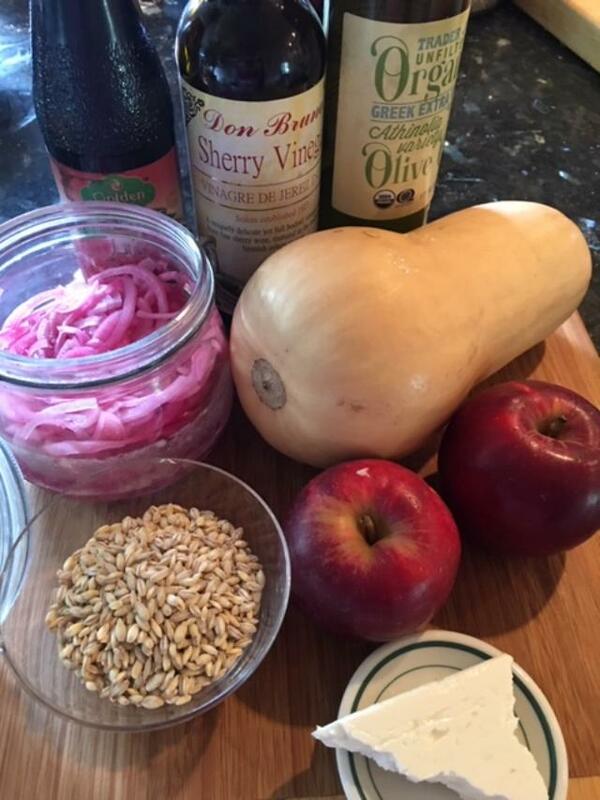 When both the barley and the squash have cooled to room temperature, add them to a shallow mixing bowl along with the chopped red onion (pickled), diced apple and currants. Drizzle over the dressing, Mix with a rubber spatula and taste for seasoning. To prepare kale for serving, pull away the tough stems, slice the leaves, knead with a pinch of salt and a few drops of olive oil. Allow the kale a few minutes to wilt and soften. You are currently browsing the Mary Jo's Kitchen blog archives for October, 2018.